Discussion in 'General Discussion' started by The Spider, Mar 12, 2006. Homer Simpson would love the newest taste sensation in minor league baseball: the doughnut burger. We kid you not. The Gateway Grizzlies of the Frontier League promised to create "Baseball's Best Burger" in time for the team's opener in late May. And they appear to have succeeded. "We have had the opportunity to bring in a new concession item for the past two seasons and each of them have been very successful," said Grizzlies general manager Tony Funderburg. He told ESPN.com that he got the idea after reading about Mulligan's in Atlanta, which has a similar sandwich called the Luther Burger. Funderberg, who has said he has eaten at least 10 of the Grizzlies' new creations as part of a "sampling process," said the team hopes to sell 100 to 200 of them a night at $4.50 each. He calls it a bargain, considering it is a meal and a dessert in one. It could be the hottest sandwich to hit the sports world since the Roethlisburger. That sandwich, invented in 2004 to honor Pittsburgh Steelers quarterback Ben Roethlisberger, is available at a place called Peppi's and includes ground beef, sausage, scrambled eggs, grilled onions and American cheese. The Grizzlies are no strangers to self-promotion through caloric innovation. Two years ago they introduced what they called "Baseball's Best Hotdog," a dog topped with two strips of bacon, sauteed onions, sauerkraut and cheddar cheese sauce. They upped the ante last year with the "Swiss Brat," a bratwurst with a slice of Swiss cheese in the middle of it, topped with sauerkraut. Locals who might not be interested in minor league baseball but who want to experiment with clogged arteries will have to buy a ticket. Funderberg said the burger will only be sold inside the stadium gates. The independent team, headquartered near St. Louis in Sauget, Ill., is in its sixth year of operation. What kind of breakfast sandwich could they make that would outdo the calories on this one? Aside from homemade 5000-calorie whatsis somebody else did. 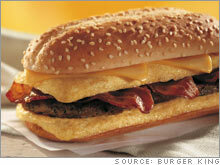 Carl's Jr Breakfast Burger: 830 calories--hamburger patty, fried egg, bacon, hash browns, cheese, and ketchup! Burger King Enormous Omelet Sandwich: 730 calories--one sausage patty, two eggs, two American cheese slices, and three strips of bacon! -Glazed coffee-flavored doughnut (do they make these? I know they've got chocolate and all, but I'm wondering if there's coffee-flavored ones) halves with syrup dots baked inside for the "bread"
And if possible, they refry all of that, together. Let's see how many would be crazy enough to eat that sandwich. Anyone else get a sharp pain in your left arm while reading that? As an aspiring medical doctor, I shake my head in sadness at such "awesome" news. And no, Aksmith, you're not alone with that feeling. My stomach also turned in a bad way seeing the pic. this monstrocity took me about 15 minutes, but I was able to eat the whole thing. My eventual goal is to eat that famous 5 lb. burger, but I can't remember who had it, or where the place was located. That doesn't even sound appealing and I love burgers and Krispy Kreme. A Glazed donut does not make a good bun on anything. Wow, so on top of completely inept management, rude and inconsiderate employees, they will also feature horrendous food? Fantastic...way to go Grizzlies. Yes...yes....It's only a matter of time until they come out with the donut-ham-hamburger. It's The Luther! They're getting their recepies from cartoons now? Why not eat a big helping of batter dipped fried butter wrapped in bacon grease? I agree whole heartedly. I like burgers...I like Krispy Kreme...I would not like them wraped up into the same sandwich. Doughnuts and meat. Two things that shouldn't ever be in the same bite. Yuck. wow, are they the ones that have the national contest that if you can eat it all +plus all the fixin's, within the time limit, that you don't have to pay for it? Even if it's not, that's just awesome that it's in Louisville. That's like only 1 1/2 drive time for me, just a skad south of Evansville, IN. woot.